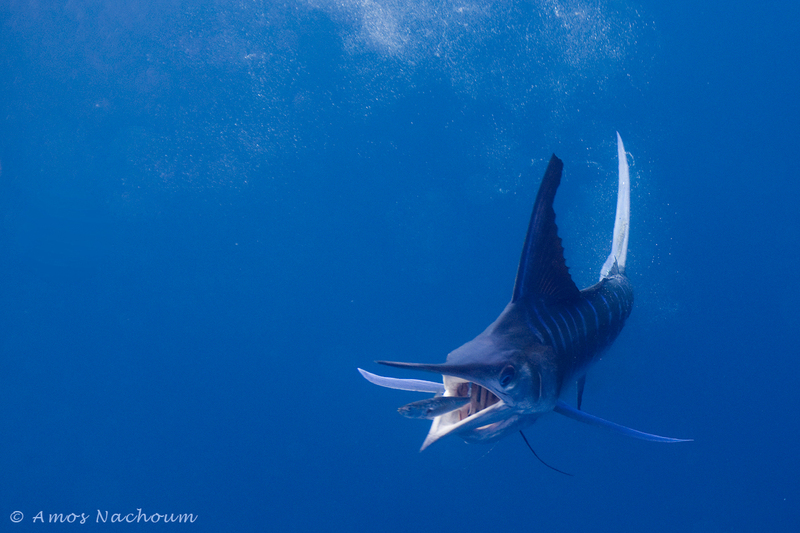 It’s been six years since renowned adventurer and wildlife photographer, Amos, traveled to the waters off the coast of Baja to witness the beauty and excitement of striped marlins feeding. After that year, the upwelling that brings the bait fish shifted and the marlins became harder to find. He was thrilled to find out that as of last year the situation has changed and nature seems to be reversing itself — the bait fish have returned, and their presence has brought striped marlins and all the ocean predators that feed on them. For 2019, we are pleased to announce that we are going to run 4 expeditions during the peak season, which is the last week of Oct to Mid-Nov. Amos plans to personally leading these trips, and he’s only looking for four divers/photographers to join him. Each trip will be six days long, operating 15 – 20 miles offshore, where we can expect 80’ – 100’ visibility and water temperatures around 76° - 80°F. The trip includes 8 nights accommodations, 6 days snorkeling and diving with pony dive gear, and photography guidance from me. (Price does not include: airfare, meals, and gratuities). Although most of the action can be observed while snorkeling or free diving, to enhance the experience and provide a unique point of view, we will be equipping our vessel with pony air tanks. These will make it possible for you to get a bottom-up perspective by diving 15 - 20 feet below the swarming bait balls while they are attacked by the speedy marlins, California seals, and if we’re lucky, maybe Brutus whales. Day 2: Drive 3.5 to 4 hours to San Carlos. Check in and prepare you gear get to know our environment in town. Days 3 – 8: Six days going to sea weather condition permitting. Searching for Striped Marlin predation, competition with Brutus whale and the bully California Seal. Day 9: Check out and transfer back to La Paz, arriving about noon time and continue for you flight to your next destination.